Disclosure: This post is sponsored by Iowa Pork Producers Association. All text and opinions are my own. My favorite meat ever will always be pork. Always. 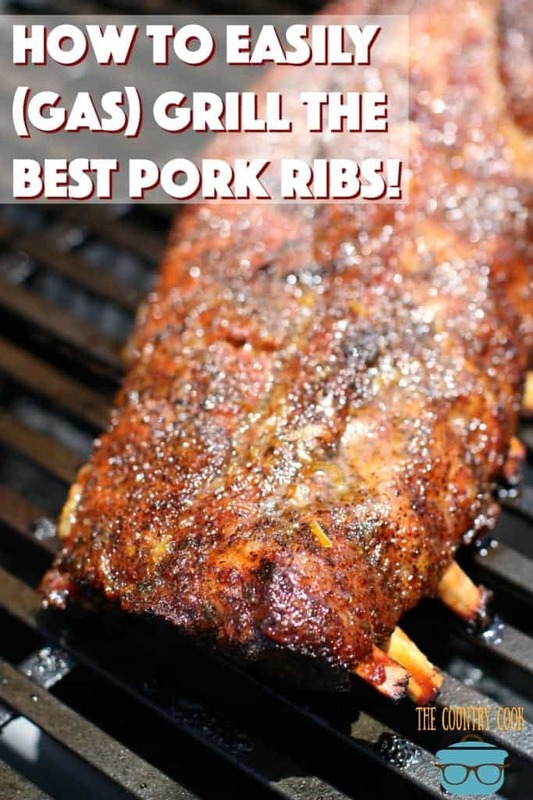 From ham, pork chops, pulled pork to delicious pork ribs like this recipe I am sharing today. I grew up near pig farms so it’s always been a familiar and comforting food to me. However, I had no idea, until recently that one-third of all the pork raised in the U.S. comes from Iowa! I have a good pork farming friend in Iowa. She has taught me a lot about how her modern family farm works. Most of the pork that her family and other Iowan families raise is eaten right here in the United States and when you buy pork at any grocery store across the United States, you are supporting family farms, like hers, in Iowa and around the country. Family farms are the back bone (literally!) of pork production. So, when you pick up some pork ribs at Walmart or Kroger (or wherever you like to shop) you are more than likely buying pork that was raised in Iowa by a family that has been doing it for generations. How cool is that?! Plus, I think it is super important, as a consumer, to know where my food is coming from and how it is being raised. It’s comforting to know that families, who care about us and their animals, are producing this food that I am enjoying. I really have found this SITE helpful to learn all about Common Production Practices here in the United States. 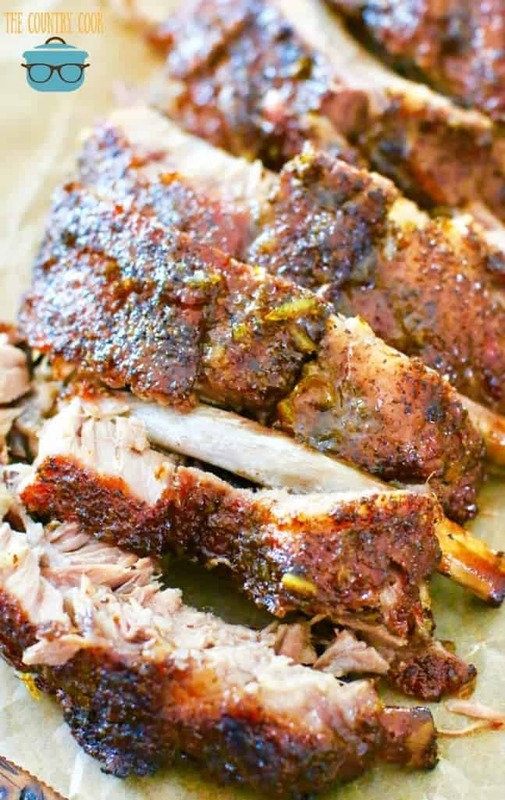 So now, let’s get to this delicious grilled pork rib recipe! I know that grilling pork ribs can seem intimidating. I hesitated to grill ribs for a long time. I just thought there were too many steps and that I needed to learn how to use a smoker or to create some sort of makeshift smoker. 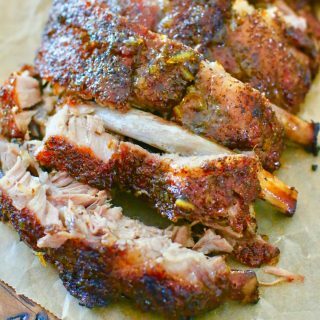 All of that is well and good, but it’s not absolutely necessary to create delicious, tender, flavorful pork ribs. And yes, you can do it on a gas grill! Just make sure your propane tank is full and I’m gonna show you how you can do this without any fancy tools or tricks. 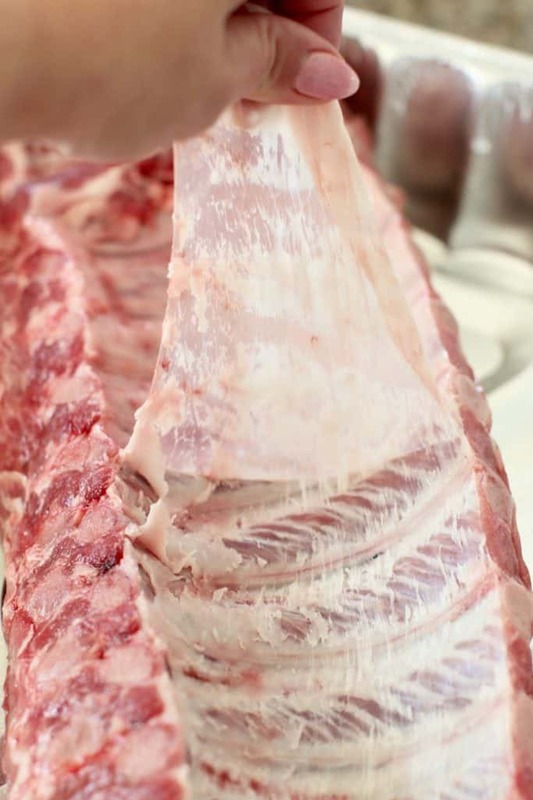 Remove pork ribs from the packaging and pat ribs dry with a paper towel. Spray the aluminum pan with nonstick cooking spray or rub with oil. 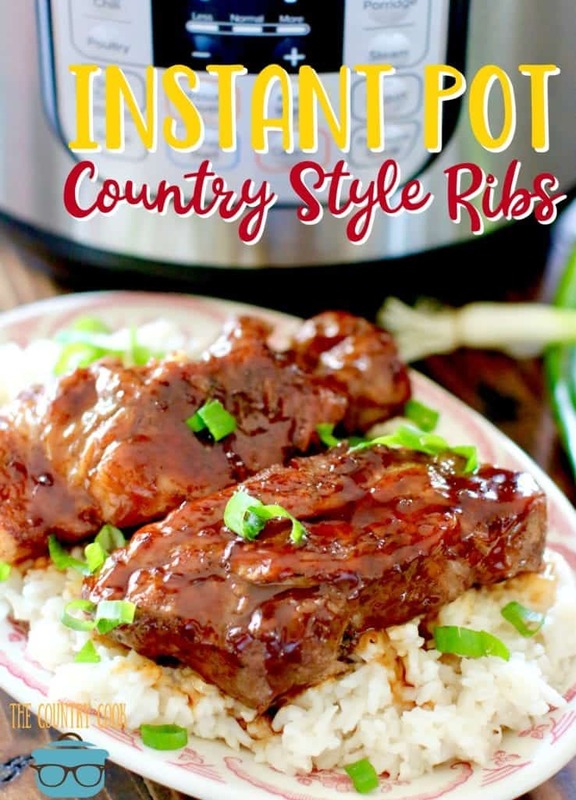 Place ribs into pan. Remove silver skin from the back side of the ribs. Cook’s note: This is optional. I like to remove it because it’s a tough and rubber-y membrane that can make it a bit more challenging to eat the ribs after they are cooked. It is super easy to remove since it will pull off in one piece. It also helps the pork rub penetrate the meat easier. Sprinkle some of the pork rub seasoning onto the back of the ribs. It’s called ‘rub’ for a reason. So you want to really get in there and rub and press it in. Note: if you’d like, you can cut the rack of ribs in half to make it easier to handle on the grill later. Flip the ribs over and season the opposite side. 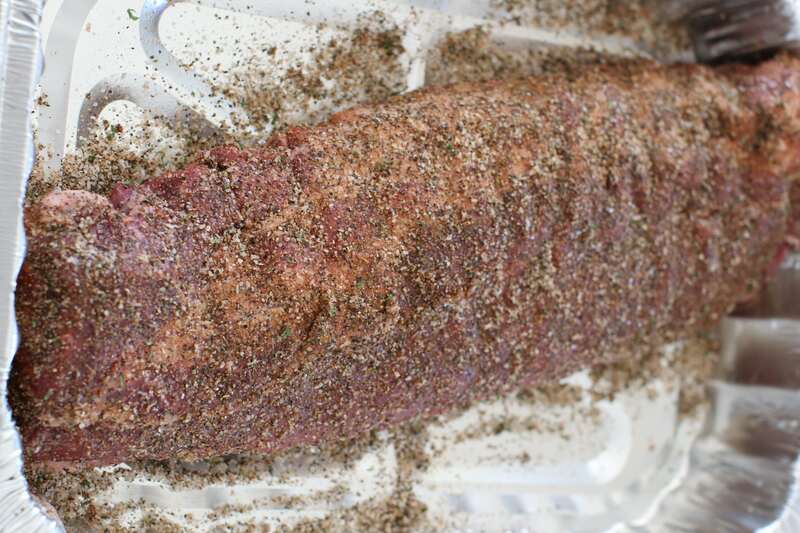 The rule of thumb with rub seasoning is however much naturally sticks to the ribs is enough. Whatever falls off after rubbing it in can be discarded. Pour apple juice into the bottom of the pan. 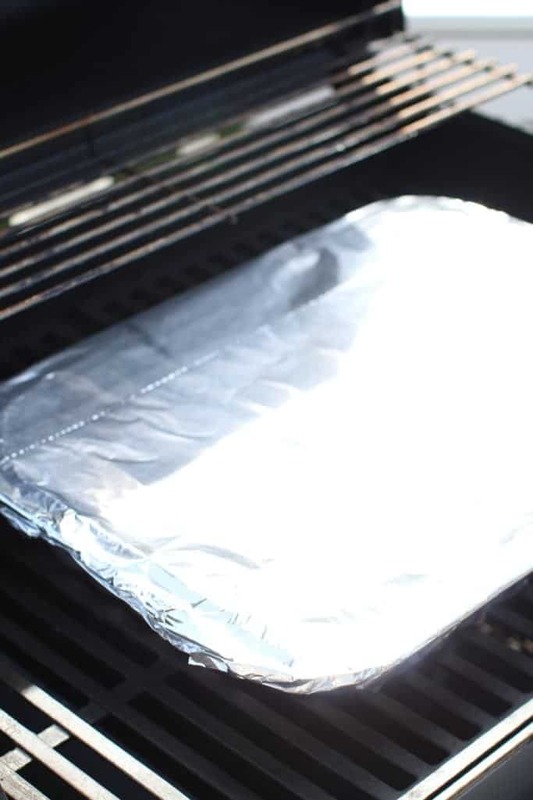 Cover pan with aluminum foil and place into the fridge until your grill is ready. We are gonna be cooking these ribs at a low temperature for over an hour. 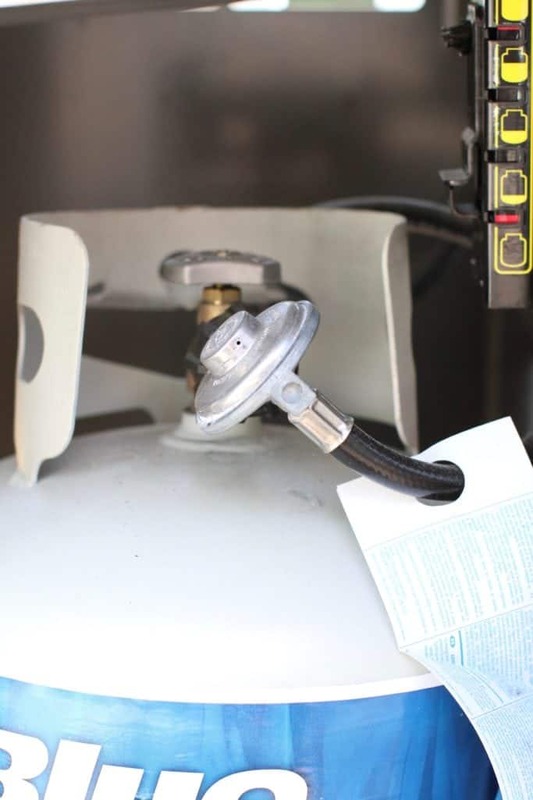 So make sure your propane tank is full or that you have another tank on standby, just in case. Preheat grill to 300f degrees. It’s important to try to maintain this temperature through the cooking process so your ribs don’t cook too fast. I have 3 burners and I will usually keep the middle burner off and just keep the two end burners on low so it’s a nice, low, indirect heat for the ribs. Ribs are safe to eat when an inserted meat thermometer (into the thickest part of the meat – away from the bone) reaches 145f degrees. But by cooking it low and slow for a longer amount of time, the ribs will end up reaching a temperature closer to 180f -190f degrees and that creates a more tender meat. 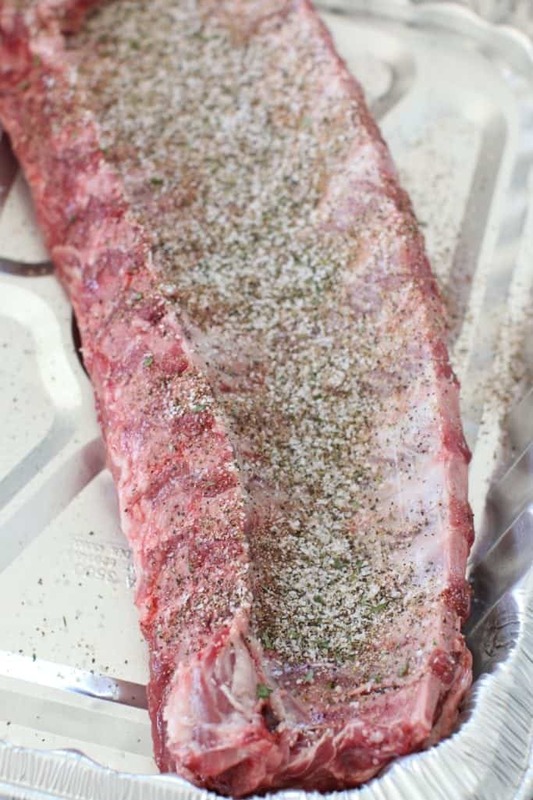 Carefully remove ribs from the pan and place directly on the grill. Ensure heat stays on low. 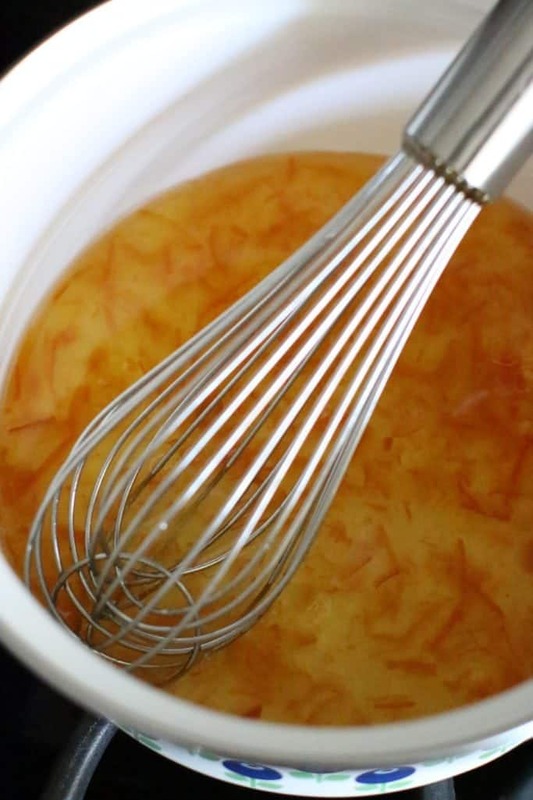 Meanwhile, in a small pot over medium heat, whisk together marmalade and vinegar. Continue to whisk until it’s combined well. This should only take a minute or two. You can do this on the grill if you have a side burner attached to your grill. Take pot off heat and baste the cooked ribs with the marmalade sauce. Make sure to coat it well. Cover grill and cook for an additional 5 minutes. Then repeat the process one more time. Carefully remove the ribs off the grill and place on a large cutting board and allow the meat to rest and cool for a few minutes. With a sharp knife, carefully cut the ribs between the bones and serve! 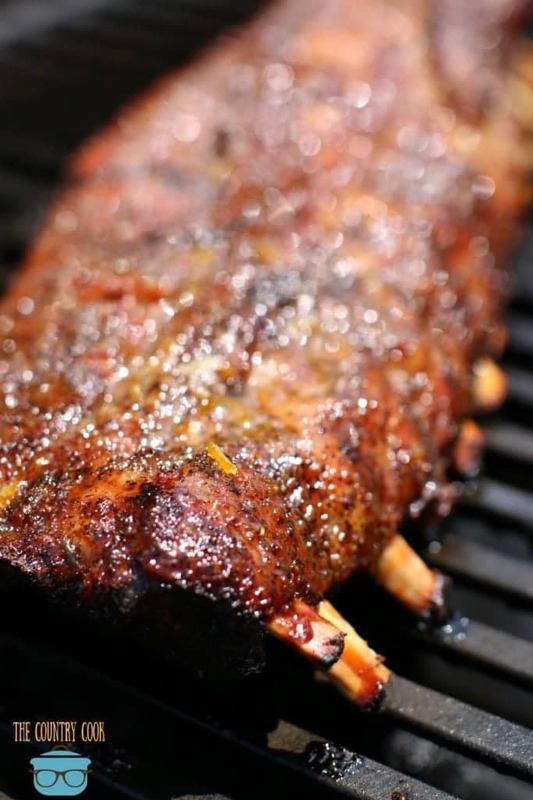 How to easily (gas) grill the best pork ribs. 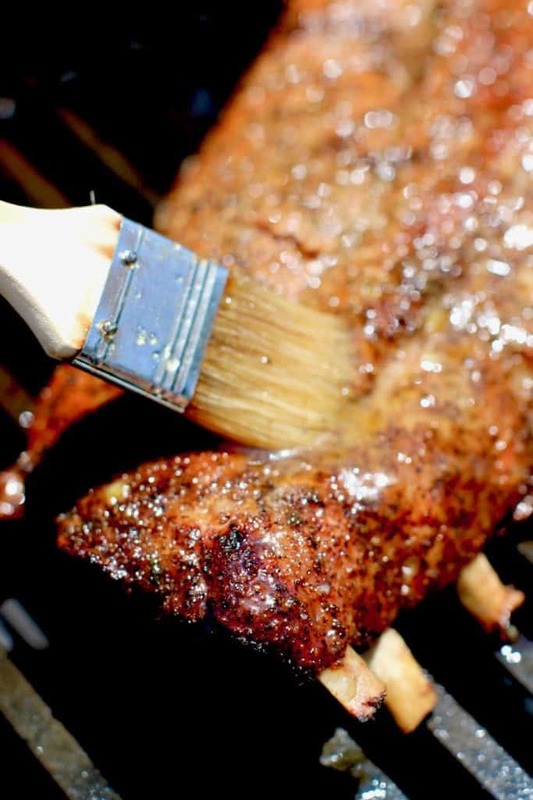 Includes a deliciously easy pork rub seasoning recipe and a simple mop sauce recipe. No special tools needed. 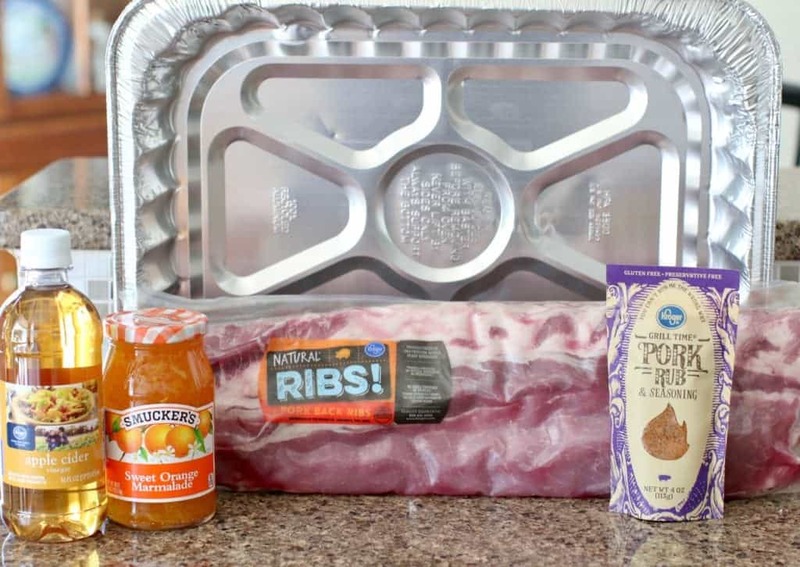 Remove pork ribs from the packaging and pat ribs dry with a paper towel. Spray the aluminum pan with nonstick cooking spray or rub with oil. Place ribs into pan. Remove silver skin from the back side of the ribs. 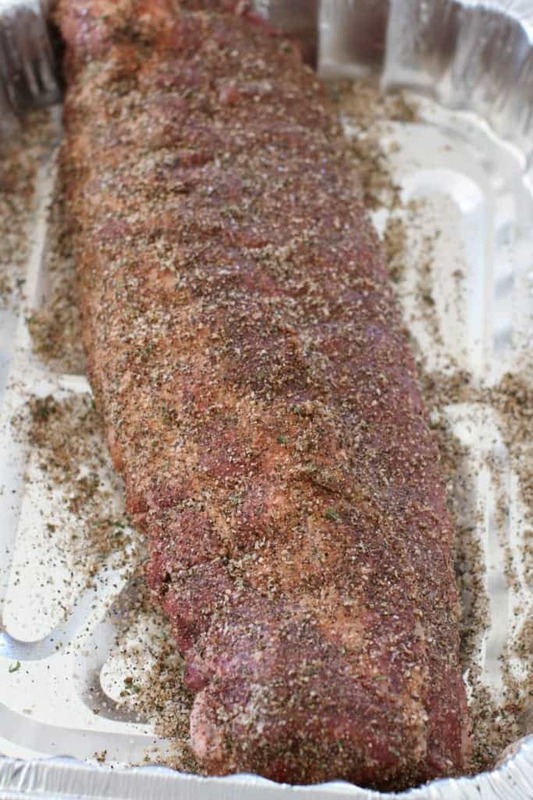 Sprinkle some of the pork rub seasoning onto the back of the ribs. It's called 'rub' for a reason. So you want to really get in there and rub and press it in. Note: if you'd like, you can cut the rack of ribs in half to make it easier to handle on the grill later. Preheat grill to 300f degrees. It's important to try to maintain this temperature through the cooking process so your ribs don't cook too fast. 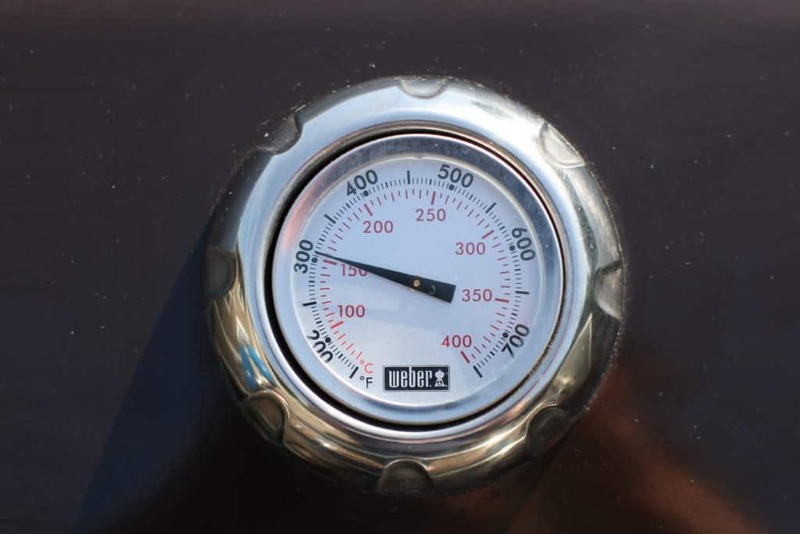 I have 3 burners and I will usually keep the middle burner off and just keep the two end burners on low so it's a nice, low, indirect heat for the ribs. Ribs are done when an inserted meat thermometer (into the thickest part of the meat - away from the bone) reaches 145f degrees. Carefully remove ribs from the pan and place directly on the grill. Ensure heat stays on low. Meanwhile, in a small pot over medium heat, whisk together marmalade and vinegar. Continue to whisk until it's combined well. This should only take a minute or two. You can do this on the grill if you have a side burner attached to your grill. Love it Carol!! Thats how you make do with what you have!! FINALLY! 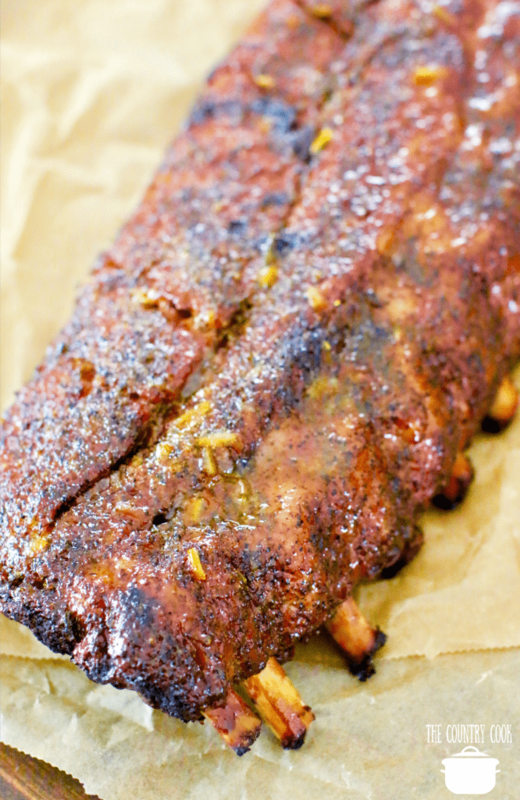 An easy recipe for ribs that doesn’t require a smoker or crazy grill tricks. I can do this!! This looks easy and I have these ingredients on hand too. Delicious!